It’s that time of year again…time to put off the yard work for the weekend, pack the kids into the car, and get out there and explore the great big world! What better way to see new sights, try new tastes, and live new adventures than to visit a festival? 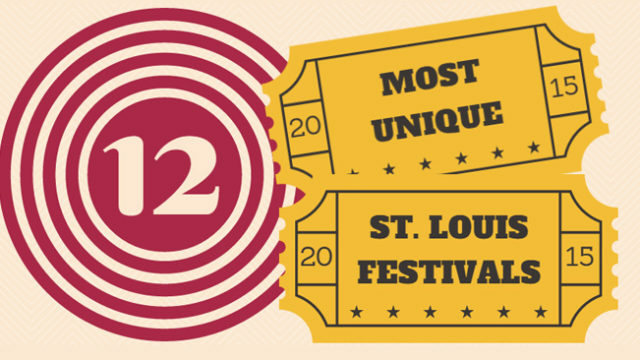 Here are 12 of the most unique St. Louis festivals in and around the city! Looking for art that doesn’t hang on the fridge? Head to beautiful downtown Belleville, IL for Art on the Square, a three day festival that is ranked as one of the best art fairs in the nation. Besides the opportunity to view and buy beautiful art from over 100 accomplished artists from around the world, this ‘big-time, small-town’ event also offers food and wine, music, and amazing visual displays, along with stuff for the kids to do at the interactive children’s art section. Your little Picasso can create their own take-away art projects…that you’ll end up hanging on the fridge (you’re not getting off that easy). Hear ye, hear ye! You don’t have to travel far to visit a beautifully wooded, 16th century French village called Petit Lyon. It’s just a stone’s throw away in Wentzville, MO at the St. Louis Renaissance Faire. Beginning Friday, May 16th and running every weekend until June 14th, the ‘Ren Faire’ is a great way to experience medieval life without all that nasty ‘Plague’ business. Jousting Knights on thundering steeds, blacksmiths and woodworkers displaying unique crafts, comedy, music, magic, and more happens every day along with amusing interactions with the colorful villagers, nobles, and peasants that populate this hamlet. Children will love the petting zoo, games, and daily free activities while adults can enjoy beer, wine, and mead at three thematic pubs. Huzzah! Here’s to the 3 Hs: health, happiness, and…horseradish?!? Did you know that 90% of the world’s horseradish comes from Madison County, Illinois? It’s true! Which explains why Collinsville lays claims on being the “Horseradish Capital of the World“. Stop by this spicy festival to dance to great bluegrass music, try your hand at the horseradish root toss, and of course, sample the many different styles of horseradish along with all the great food it goes on. If it’s got anything to do with summer’s sweetest treat, you’re bound to find it at the Kimmswick Strawberry Festival in Kimmswick, Missouri. Fresh Strawberries, Strawberry Shortcake, Chocolate Covered Strawberries, Strawberry Cheesecake, Strawberry water, Strawberry Iced Tea, Strawberry Wine…if it’s strawberries you want, this is the place to be. And when you’ve had your fill of berries, you can check out the other festival standards like the petting zoo, train and pony rides, bounce houses, games, face painters, caricature artists, and more. The festival also coincides with one of Kimmswick’s bi-annual Bluegrass festivals, so you’ll be able to check out some great pickin’ of the banjo as you get some great pickin’ on the berries! Did you know that hummingbirds are the only birds that can fly backwards? Or that they have little to no sense of smell? If you think those are interesting facts, then you’ll want to definitely see these little marvels up close at the Hummingbird Festival at the Pere Marquette Lodge & Conference Center in Grafton, IL . Watch experts handle these unique, one-of-a-kind birds as they’re measured, weighed and banded at this annual celebration of our feathery friends. There’s also live music, wine tasting, children’s activities, unique craft and art vendors, and local restaurant favorites. 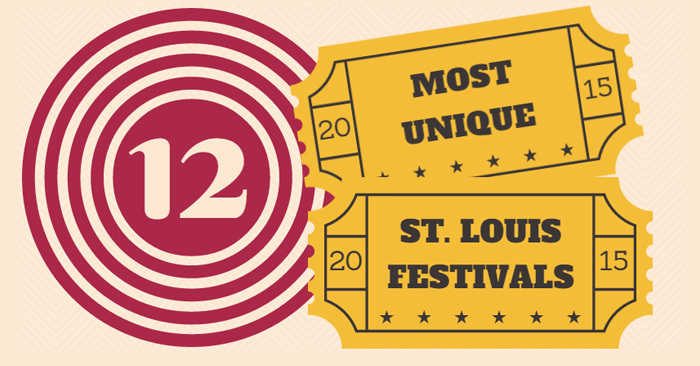 We’d be crazy not to include the ‘Big Daddy’ of area festivals, America’s Biggest Birthday Party…Fair Saint Louis. For years, this free 4th of July party was held beneath the Gateway Arch, but with the Arch grounds under major reconstruction since 2013, the Fair has temporarily been moved to our beloved Forest Park. With the Fair making its move to Forest Park last summer, an estimated quarter million people gathered on Art Hill in 2014 to enjoy the event’s many amazing sights, sounds and experiences, such as the Family Festival Zone, the VP Parade, rows of food and craft vendors and live music from an outstanding lineup of national recording artists, including Bonnie Raitt and The Fray. Fair Saint Louis 2015 promises to be another unforgettable experience as Blondie, Melissa Etheridge, Parmalee, Chris Young, Natalie Stovall and The Drive and Kool & the Gang grace the Budweiser Stage. And what Independence Day celebration doesn’t have fireworks? The Fair provides fireworks every night of the festival, not just on the 4th, so visit any (or every) day of this weekend festival and you’re guaranteed to have a blast! Ketchup or catsup? If you ask the residents of Collinsville, IL, there’s only one way to spell America’s #1 condiment: C.A.T.S.U.P. That’s because this city is home to the World’s Largest Catsup Bottle and of course, the World’s Largest Catsup Bottle Festival. This annual celebration pays tribute to Collinsville’s most unique landmark, a massive water tower that is fashioned to look just like a bottle of Brook’s Catsup. Once home to the Brook’s bottling plant, the city now celebrates the landmark’s birthday with a classic car show, music, craft vendors, a ‘Big Bottle’ bike ride, magic shows and what else…catsup tasting. All hands on deck for the Shiver Me Timbers Towboat Festival as the city of Grafton, IL celebrates its Mississippi River heritage with this fun look at its historical and modern day life on the Big Muddy. You’ll be able to check out these massive ships as they slowly move their cargo up and down the river from the safety of this ferry town and experience boat tours that will show you just how enormous these towboats really are. Throw in live music, great local food vendors, and an amazing array of craft booths and you’ve got one heck of a haul! How do you make soybeans fun? The folks in Mexico, MO have it figured out with their Jaycees Soybean Festival. Enter your kids into the Little Mr. & Miss Soybean beauty pageant, submit your ‘que into the St. Louis Barbeque Society sanctioned BBQ Contest, bring your classic car/motorcycle to the auto show, showcase your singing in their Mexico Idol competition or just show up for the great music, food, and soybean related activities. If you only think of golf, Braveheart, and haggis when you hear ‘Scotland’ prepare to have your worldview blown away at the St. Louis Scottish Games and Cultural Festival in Chesterfield, MO. It’s all fun and games as this celebration features more than 150 highland athletes, bagpipers, highland dancing, food and drinks, kid’s activities, and more things ‘Scottish’ than you can toss a caber at. Kimmswick, MO makes another appearance on our list with their annual Apple Butter Festival. This is the largest event in Jefferson County, MO, drawing close to 100,000 visitors over the course of 2 days. The Kimmswick Historical Society makes and sells their famous Apple Butter and there’s live Bluegrass music serenading you as hundreds of vendor booths line the city streets selling a variety of crafts and food items. Come early, come hungry, and be sure to wear comfortable walking shoes! As lovers of all things travel, we definitely can’t wait for the Festival of Nations. It’s a multiethnic celebration presented by St. Louis’ International Institute and over 125 community organizations that bring the world’s food, culture, and music to Tower Grove Park in south St. Louis. Admission and entertainment are free and food and crafts are affordably priced. With 40 ethnic food vendors, 35 international craft booths, and four stages of music and dance performances, there’s something for every taste. With over 140,000 visitors annually, this event has become the St. Louis area’s largest multicultural festival. If you plan to attend any of these festivals and need a place to rest up for the next one, there’s always a Drury Hotel nearby. With over 20 locations in and around St. Louis, there’s sure to be one near your favorite area attraction. 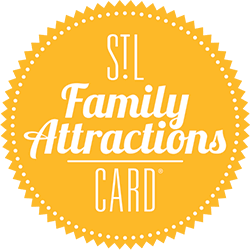 And save $10 on your booking at any Drury across the nation by using the Family Attractions Card Promotional Rate code FAMILY.